Forty Lashes Less One tells the story of Raymond San Carlos and Harold Jackson, two men accused of murder and held in the hellish Yuma Prison. Race, crime, and violence are all themes in the novel, making it just the kind of stuff Tarantino loves. The filmmaker’s Forty Lashes Less One project has been rumored since 2000; in 2007, he said he had written about 20 pages of an adapted script, but nothing ever came of it. 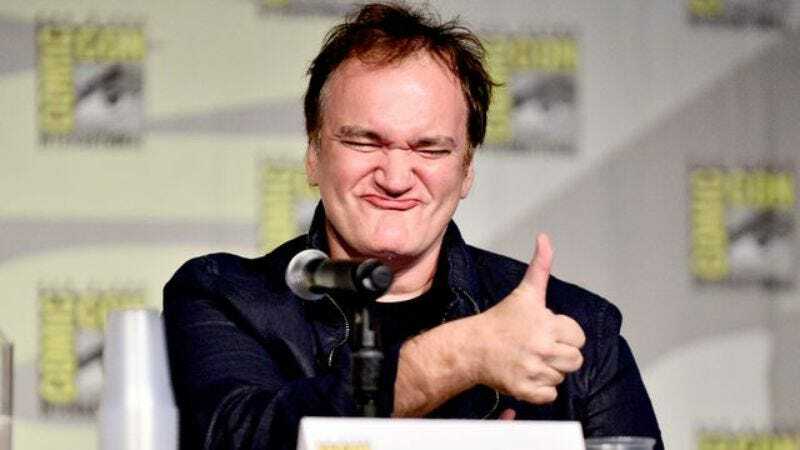 Now, Tarantino says he is thinking about making the adaptation for a television as a limited four- or six-hour miniseries, but who knows with this guy. One thing’s for sure: He won’t be reading any of the reviews of his (supposed) future TV project. Tarantino is no stranger to Leonard adaptations: His 1997 movie Jackie Brown is based on the author’s novel Rum Punch. But this would be Tarantino’s first attempt at making his own major television series. Meanwhile, other Leonard adaptations have found a home on television. AMC just inked a deal with Justified—based on Leonard’s short story “Fire In The Hole”—executive producer Chris Provenzano to make a new Western series adapted from Gunsights, a 1979 novel about former Army buddies who end up on opposite sides of a land grab, complicating their relationship. Only time will tell if Tarantino’s television adaptation ever gets made, or if it just ends up vaulted with Kill Bill: Volume 3. His latest movie, The Hateful Eight, launches its special 70mm roadshow run on Christmas Day.